I have a great surprise for all DKL3 fans: a hack that translates the Game Boy Color version from Japanese to English! As some people know, there was an English version released for the Game Boy and the Super Game Boy, and three years later, there was a Japanese version released for the Game Boy Color. The GBC version was Japanese exclusive for more than a decade... until now! This, honestly, is something that I've wanted to do for years, starting in late 2007, but at the time I was a very inexperienced hacker. I had not known anything about assembly, or even pointers, but I've since learned quite a bit and I've finally been able to complete this. And you all can now enjoy the colorful version in English! This hack uses the Japanese version as a base (hacking the original GB version and making it work for the GBC would have been far too much work), but the text is heavily based off the original English script. So if you've played the original English version, it should be familiar to you. Nonetheless, I fixed some typos (namely the misspelling of "Kremlings", and the lack of punctuation in K. Rool's Last Stand, among other things) and tweaked a few other things, like changing "Select game" to "Select a file" (thanks to Gaz for suggesting the latter). I also used the DKC SNES font instead of the original DKL2/3 font -- I thought it looked much better, and it also has uppercase and lowercase. Yes, there's actually lowercase this time. I didn't like seeing it in ALL CAPS before. The title screen was also changed -- basically the logo was reverted to the English 1.1 logo. I could have just as easily picked English 1.0 (see both title screens here), but I picked 1.1 due to personal preference. My English cart is version 1.1, so I'm completely used to its title screen. I can use the other one if there's a lot of demand for it, though... Also, I left the Press Start text alone -- I liked it better in the Japanese version than in the English version. The newer patches also restore features that were missing in the Japanese version. First, the world map animations are now back, to everybody's delight. Second, the Time Attack screen was fixed -- you can see your most recent time on the bottom of the screen now, just as you could in the original Game Boy version. Lastly, Bear's animation has been restored, instead of being static like in the Japanese version. Hopefully people like these changes! The newest patch also fixes a few bugs that were originally present in retail copies of DKL3 (and even DKL2 in some cases), such as the backup save restoration bug, the bonus counter bug, and the desynced Jetty Jitters demo. I tested this hack thoroughly in the BGB emulator -- I completed a 103% run with it, so in theory there shouldn't be any bugs, other than what the original game already had (while I did fix some, fixing most of the others is a low priority due to the difficulty of doing so). I also tested this on real hardware using an Everdrive GB flashcart, as well as Lameboy for DS and VBA-GX for Wii (to a lesser extent), and I did not find issues in any of these. This all sounds complicated, but this is the only translation hack that I've ever fully completed. Of course, there was already an English script, there isn't much text in the game (since it's a platformer), and the screens were practically designed for English text, so compared to other games, there wasn't too much ASM code that was necessary to change (and thus is one of the easiest games to hack as far as text goes), but at the same time, I don't think it's something that an ordinary hacker can pull off. Please apply the patch to a clean (i.e. unmodified) ROM only. Do not apply the patch to a ROM that's already patched -- this can cause unpredictable problems! You should especially be aware of this if you applied an earlier patch to your DKL3 ROM and wish to use a newer one. Enjoy playing DKL3 in color in English!! Excellent work! English-speaking DKL3 fans the world over will appreciate this. If you do the Twitter thing at all, tweet about this and I'll retweet to spread the word, if you like. I'll also plonk a news report on the Atlas linking to this topic... I should definitely do more to promote these excellent hacking/translation projects — no time like the present to start, eh? Unfortunately, I don't have a Twitter account (I've never really been into social networking sites), so I can't really do anything about that. I've considered making a video about this on YouTube, though... although I realize that isn't the same thing. Actually, I was the first one to recieve this all... through PM, as Blaziken 257 felt sorry that he was so busy and took him so long to reply to my PMs (profiles don't have messages). Thanks to Blaziken, I happen to have the early builds from one-two weeks old. Another is a near-public version that's about three days old or so. EDIT: B257 requested I remove them so I did. CBFD, I'm sure Blaz would post those early builds himself if he wanted them to be widely available... did you check with him before posting them? There's probably a reason he only started a topic when he was ready with the final build. Releasing pre-release versions into the wild can muddy the waters, and leave people wondering why certain things are incomplete, when really they just have an early, incomplete build. I appreciate your generosity and proactive archiving, don't get me wrong, but these are things to consider. Then I realised that the number is probably Blaziken's Pokedex number, haha. Not such a coincidence after all. I've considered making a video about this on YouTube, though... although I realize that isn't the same thing. You're right, it's not the same thing... it's quite a bit better. Not very often... I was really meaning hacks in general, I just think of hacks and translations somewhat separately, even though fan translations would typically fall neatly within the 'hack' category. EDIT: Is it just me or is me, Blaziken257 and Qyzbud the only ones who notice/care? I have a new version of the English patch! It comes with numerous improvements, many of which have been backported from the Spanish patch. The level Karbine Kaos is now in lowercase, which was both backported from the Spanish translation and is consistent with this article on Super Mario Wiki. The boss's name is still in ALL CAPS, though, like in the SNES version of DKC3. Bonus level descriptions are now in lowercase. This is backported from the Spanish version. What do people think of this capitalization where the "the" is in lowercase? This was hard for me to decide because none of the official games use lowercase letters for their bonus games. Without further ado, here is the patch! - Learning ASM (not that I did that just for this project, but it's still necessary). - Finding the graphics for kana, and changing them into the English alphabet. - Finding the text strings. - Finding pointers for text. While level pointers aren't too complicated since they're in a pointer table, other screens, like the bonus screens, the K. Rool screens, etc. have pointers all over the place, so I had to use BGB's disassembler to find them. It also doesn't help that some pointers are big endian (which is very unusual for a Game Boy game), and others are little endian. - Finding the graphics for the title screen -- luckily, it's uncompressed in the GBC version. - Finding the data that arranges the tiles on the title screen (also uncompressed in the GBC version). - Finding similar data for other screens, such as the logo screen, and the Game Boy screen. - Finding palette data for the title screen, to accomodate the logo change. - Finding data for the cast; naturally I used the English version as a base for the text. - Spending hours finding code that would take care of the map animations in the GB version, and seeing what was missing in the GBC version. When I found that, I was able to add the code back in. - Finding the code when a demo (from the title screen) starts, and eventually finding the button sequence data for Jetty Jitters. After experimenting, I was able to fix the desync by changing a single byte. - Taking notes of all this data as I found it, so that I wouldn't have to spend significant amounts of time searching the data a second time when making the Spanish hack (or vice versa with features first in the Spanish hack, like map animations). Believe me, editing the Spanish text didn't take me anywhere near as long due to this. - In the case of the Spanish hack, I had to send the dumped English text, with occasional annotations (for context, etc.) to Kiddy14 so that he could translate it to Spanish. - Also in the case of the Spanish hack, I had to figure out how to shift the bonus text up to allow room for two lines. Since the game uses some raster scrolling effect where it shakes up and down, I changed a couple of values to make the text scroll higher up by 4 pixels. - Writing the README files (which are lengthy), taking screenshots, making videos, etc. for the convenience of people using the hacks. It's a long list, but I think covered everything. First, I wanted to let you know that I joined the forum just to tell you that I like you hack! Thank you. I am a fan of this game. I just wanted to share my opinion with you. I think that the all-caps for bonuses is better, because the original DKC3 does that too. I also wanted to encourage you and let you know that I look forward to having the bear animation back. Any idea when you will get started on that? I am currently using your V1.1 ips. Thank you for your feedback on this hack! I am glad you like it. As for the bonuses, I can change them back to lowercase, although I would like to see additional opinions on this first. On one hand, none of the official DK games have ever used lowercase letters for bonus stage descriptions (not even the GBA games), so I can see where the lowercase letters are a bit out of place, but on the other hand, I felt it was odd to see the bonus stage descriptions in ALL CAPS while the rest of the hack uses lowercase letters for stuff. So... I am on a bind on this one. As for restoring Bear's animation, I would love to do that, but I've been unable to figure it out so far. A while back, I tried to trace the code in both the English and Japanese versions (which I also did for the map animations, as well as the Time Attack last time text), but I have not had much luck yet. The code seems quite different in the Japanese version, which confounds things, and most of it is in a ROM bank which is nearly full (for a technical desciption, ROM banks on the Game Boy are 16KB, and a lot of code that I've seen for Bear's animation takes place in bank 0 (0x0000-0x3FFF in ROM), which always remains in the GB's memory). I will have a go at it again, but don't expect it to happen soon. I also need to say that for over a month now, I've been busier than I used to be, and I can't see that changing anytime soon, so generally I have less free time than I used to. I actually know some GB Z80 ASM. I actually made an English Pokemon Green. I know that Rom0:40 is always vblank. But that does complicate things since the bear stuff is always loaded, and what it may affect since it is in bank 0. Maybe Nintendo did that because the the GBC hardware handles things differently. I wish there was a disassemble of DKL III so that I could help you. There was one on Pokemon, so making custom code was easy. If you find the function, is there a way that maybe you could do a jump to free space and make custom ASM code? Maybe there isn't space at the current spot. But this may require you to locate the code in English first. Sorry, I can't help you on this. But thanks for considering making bonuses upper case again. Could you please fix this, Blaziken257? That would be nice if you could. So, after over a year since the last time I updated this patch, I have a new one coming out soon! This makes a few improvements over the last patch, and I'm sure that people will be happy with them. 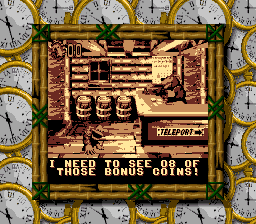 Third, when Bear tells you how many bonus coins you need in Cape Codswallop, there is now a leading zero so that it says "08", just like in the original Game Boy version. In the Game Boy Color version, Rareware replaced the leading zero with a blank space so that it said " 8" instead. This patch makes it more like the GB version. Here are a few screenshot of the various versions to compare below. This patch also fixes some bugs. One of the bugs that I fixed is the bonus counter glitch, which first appeared in DKL2. This means that when losing to a bonus stage with at least one star or enemy remaining, defeating enemies in the main level will no longer cause the Bonus Coin sound effect to play in this patch. The patch also fixes the backup save restoration bug, which also first appeared in DKL2. This means that if you have a corrupt save file but at least one functional backup copy (DKL2 and DKL3 store two backups per file), the game will properly load the first functional backup copy it finds. Due to this, you won't be seeing odd things like this or this anymore. This bug fix was originally a standalone patch here, but now has been part of this English patch. Finally, the text for the level names on the world map screen prints a tiny bit faster, as it now uses the GBC's second VRAM bank (which Rareware never used for some reason until DKC GBC), and this allows the entire alphabet tiles to be loaded just once, instead of loading tiles every time you go from one level to another. This improvement wasn't as big as I had hoped, but it's better than nothing. You've done so much works on this, it's extremely impressive! I actually plan on doing a Let's Play of Donkey Kong Land 3 soon and I'm going to use this patch for it. I'm glad to hear it! Let me know when you get around to doing your Let's Play of this game. I am happy that people like my patch! Make sure that you use this patch on a CLEAN Japanese ROM, not one that's already patched. I don't want to hear about it if you patched a ROM that's already patched, because that can cause unpredictable issues. Don't patch an English ROM either, for obvious reasons. (You'd be surprised how often I've seen this type of situation with other ROM hacking projects that I've been involved in.) If you are in doubt, use the .bps file, not the .ips one, since it's harder to accidentally apply the patch to the wrong file that way. You can see a list of changes I made a couple of posts up. The most notable change is that Bear's animation is restored! And of course, there are other ones as well. So even if you played an earlier patch, I suggest you try this one! Also, if you spot any bugs in this release, please let me know! But if you find a bug, make sure that the bug isn't already in a clean (i.e. unpatched) ROM. If that's the case, then that's not my fault. I only want to know about bugs that I introduced, if there are any. Finally, I hate that Nintendo refuses to release the DKC and DKL games for the Virtual Console in North America while the rest of the world gets them, so I don't feel bad at all for continuing to work on this patch. This patch trumps any VC version of DKL3 anyway, because it's either in monochrome (in Europe) or in Japanese without map animations (in Japan). That's all I have to say for now. Enjoy the newest DKL3 patch! Excellent job, Blaziken257. Have your 90th banana! It's weird how you say that you have problems with the original DKL3 for its monochrome colors. I thought that was the version you grew up with.